Jainism in Pakistan (پاکستان میں جین مت) has an extensive heritage and history, although Jains form a very small community in the country today. Memorial shrine of Vijayanandsuri in Gujranwala. Now used as a police station of Sabzi Mandi area. Several ancient Jain shrines are scattered across the country. Baba Dharam Dass was a holy man whose tomb is located near the bank of a creek called (Deoka or Deokay or Degh) near Chawinda Phatic, behind the agricultural main office in Pasrur, near the city of Sialkot in Punjab, Pakistan. Another prominent Jain monk of the region was Vijayanandsuri of Gujranwala, whose samadhi (memorial shrine) still stands in the city. Bhabra (or Bhabhra) is an ancient merchant community from Punjab which mainly follows Jainism. The original home region of the Bhabras is now in Pakistan. While practically all the Bhabras have left Pakistan, many cities still have sections named after Bhabras. Sialkot: All the Jains here were Bhabra and mainly lived in Sialkot and Pasrur. The Serai Bhabrian and Bhabrian Wala localities are named after them. There were several Jain temples here before partition of India. Pasrur: Pasrur was developed by a Jain zamindar who was granted land by Raja Maan Singh. Baba Dharam Dass belonged to the zamindar family who was murdered on a trading visit. Gujranwala: Two old Jain libraries managed by Lala Karam Chand Bhabra were present here which were visited by Ramkrishna Gopal Bhandarkar. Lahore: There were Jain temples at localities still called Thari Bhabrian and Gali Bhabrian. Rawalpindi: Bhabra Bazar is named after them. Mianwali: A well known cast still present in majority there nowadays. Some also lived in Sindh. Jain temple, Thari Bhabrian Lahore City. Jain Digambar Temple with Shikhar, Old Anarkali Jain Mandir Chawk: This temple was destroyed in the riots of 1992. Now an Islamic school is run from the former temple. 31°33′41″N 74°18′29″E﻿ / ﻿31.561389°N 74.308056°E﻿ / 31.561389; 74.308056. Nagar Bazaar temple is present in the main bazar of the Nangar Parkar town. The structure of the temple, including the shikhar and the torana gateway is completely intact. It was apparently in use until the independence of Pakistan in 1947, and perhaps for some years even after that. There is also a ruined temple outside of the town. Bhodesar Jain mandir, 7.2 km from Nagar, was the region's capital during Sodha rule. Remains of three temples, are present. In 1897, two of them were being used as cattle stalls and the third had holes in the back. The oldest temple, was built in the classical style with stones without any mortar, built around 9th century. It is built on a high platform and reached by a series of steps carved into the rock. It has beautifully carved huge stone columns and other structural elements. The remaining walls are unstable and partially collapsed. Parts of the building had been dismantled by the locals who used the bricks to construct their homes. It is perhaps the most spectacular of the monuments in Sindh. The two other Jain temples are said to have been built in 1375 CE and 1449 CE built of kanjur and redstone, with fine carvings and corbelled domes. Karoonjar Jain mandir is at the base of the mountain. 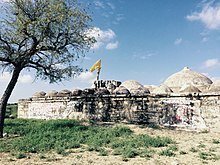 Virvah Jain mandir, are a number of ruins of Jain temples here. One of the temples had 27 devakulikas in it. The ruins of legendary Parinagar are nearby. One of the temples is in good preservation. Virvah Gori mandir is 14 miles from Viravah. The legendary temple with 52 subsidiary shrines was built in AD 1375-6. It is dedicated to Jain tirthankar Gori Parshvanatha. Prior to 1947, there were small communities of Jains in the Punjab and Sindh regions. Nearly all of them migrated to India during the partition in 1947. ^ a b Khalid, Haroon (4 September 2016). "Sacred geography: Why Hindus, Buddhist, Jains, Sikhs should object to Pakistan being called hell". Dawn. Retrieved 4 September 2016. ^ "jainrelicsinpakistan - abafna". Abafna.googlepages.com. Retrieved 2012-04-20. ^ Ghauri, Aamir (5 December 2002). "Demolishing history in Pakistan". BBC News. ^ Kaminsky, Arnold P.; Long, Roger D. (2011). India Today: An Encyclopedia of Life in the Republic. ABC-CLIO. p. 372. ISBN 978-0-31337-462-3.